Check out this article as you will get all information about Lionel Messi-magical player for Barcelona and Argentina.This article gives you details about Biography and profile of Lionel Messi. Career Awards and goals scored by Lionel Messi is quoted in this article. Details about Hat Trick scored by Messi is also given in this article. 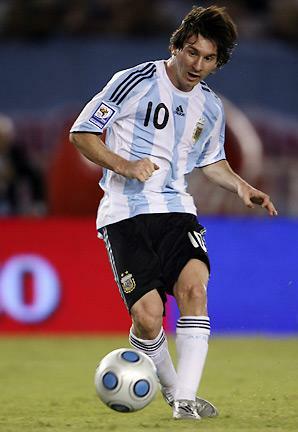 The full name of Lionel Messi is Luis Lionel Andrés Messi who was born in Rosario, Argentina in the year 1987 june 24. At the childhood days itself messi showed high skills in fotball. In the begining of the football career messi is having Harmone deficiency, but his parents were not in a position to treat him as they come from poor background and they planned to move in Barcelona, spain for better treatment. This move was the turning point in his life as he joined the FCBarcelono football club. At the age of 16 he made his first appearance against Porto. From 2005 onwards Messi became a regular palyer in Barcelona. Messi is highly creative and skillful player in Football. Messi is known as the successor of Diego Maradona. Messi was Played as Forward player for Barcelona. In the same year Messi got a record as the Youngest player to score a league goal his Barcelona club. At that time Messi was only 17 years old. In the beginning of his career Lionel Messi got an unbelievable offer from Spain to play for their national team but he is not interested to play for Spain. As he was born in Argentina Messi was interested to play for his birth country and waited for a chance to play for Argentina. In june 2005 Messi was selected in Argentina under 20 team and played an important role in winning World Youth Championship held in Netherlands. In that championship Lionel Messi was awarded the golden Boot for his fantastic 6 goals in the championship. He had also won the golden ball in the same championship for best player of that tournament. In his first UEFA champions League. he had shown som high skills with his magical passes with Ronaldinho and some important goals. He had also awarded Golden boy 2005 for the best under 21 Player in Europe. Messi was extended his contract with Barcelona to 2014. "I see him as very similar to me"
"He's a leader and is offering lessons in beautiful football. He has something different to any other player in the world." Lionel Messi is the highest goalscorer for Barcelona in both International matches as well as in Champions League. Record for most goals in a season is shared by Lionel Messi and Ronaldo. Lionel Messi scored Hat Trick nine times for Barcelona. Details are given below. 1)First Hat Trick of Mesii is against Atlanta mandrid on March 11 2007 where Barcelona tied the match for 3-3. 2)Second Hat Trick is against Real mandrid in January 6 2009, where Barcelona wins the match for 3-1. 3)Third Hat Trick was against Tenerife on January 10 2010 where Barcelona wins the match for 5-0. 4)Fourth Hat Trick was scored in March 14 2010 against Valencia and the score is 3-0 win for Barcelona. 5)Fifth one is against R. Zaragoza on March 21 2010 where Barcelona win the match by 4-2. 6)Messi's another Hat Trick was against Arsenal on April 6 2010 where he scored four times and won the match for 4-1. 7)Messi again scored a Hat Trick against Almeria in the same year on November 20 2010 which provide a huge victory for Barcelona for 8-0. 8)On January 12 2011, Messi again scored a hat Trick for Barcelona against Betis and wins the match for 5-0. 9)The last hat Trick is scored against Atlanta Mandrid on February 5 2011 where Barcelona beaten A Mandrid for 3 gaols.